Front Row from Left: Mrs. Malkanthi Bandara (Additional Director of Economic Research), Mr. Dharmasri Kumaratunge (Additional Director of Economic Research), Mr. K D Ranasinghe (Assistant Governor), Mr. B D W Ananda Silva (Deputy Governor), Prof. Justin Yifu Lin (Honorary Dean of National School of Development at Peking University), Mr. Arjuna Mahendran (Governor), Dr. P. Nandalal Weerasinghe (Deputy Governor), Mr. P. Samarasiri (Deputy Governor), Mr. Mahinda Siriwardana (Director of Economic Research) and Dr. (Mrs.) Yuthika Indraratne (Additional Director of Economic Research and Chairperson of Research Advisory Panel). 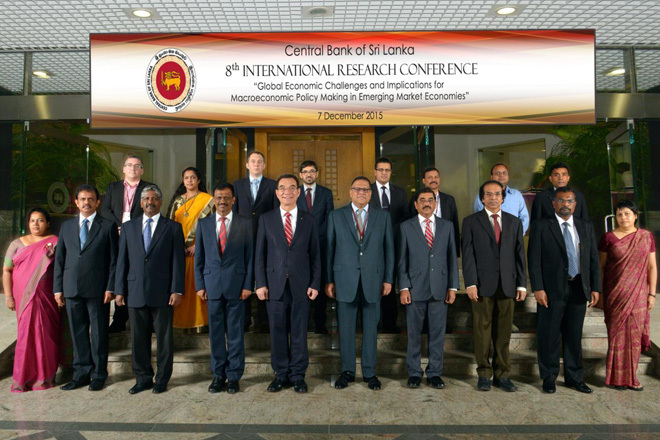 The 8th International Research Conference of the Central Bank of Sri Lanka was held on 7 December 2015 at the John Exter International Conference Hall of the Central Bank. The conference, organised by the Economic Research Department of the Central Bank, aims to stimulate research on current themes while providing a forum for researchers of central banks, monetary authorities, universities and other research institutions to present recent theoretical and empirical work on issues relating to central banking and the macro economy. Since its inception in 2008, the International Research Conference has attracted scholars from across the globe and featured keynote addresses by central bankers, eminent academics, and policy makers. This year’s conference was held under the broad theme of ‘Global Economic Challenges and Implications for Macroeconomic Policy Making in Emerging Market Economies.’ The conference brought together distinguished members of academia, government institutions, policy institutions and research institutions. The keynote address of the conference was delivered by Professor Justin Yifu Lin, former Senior Vice President and Chief Economist of the World Bank, who currently holds the positions of Honorary Dean, National School of Development at Peking University and Vice Chairman of the All-China Federation of Industry and Commerce. In his keynote address titled “Development Strategy, Development Performance and Macro Stability: A New Structural Economics Perspective”, Professor Lin elaborated on the nature of modern income growth as a process of continuous structural change in technology and industry to increase labour productivity and investment in soft and hard infrastructure in the economy to help reduce transaction costs. Professor Lin also argued that the low-income and middle-income traps are outcomes of a country’s inability to generate dynamic structural changes, which results in slower growth in developing countries. Therefore, Professor Lin’s prescription of ‘New’ Structural Economics to achieve dynamic growth emphasises the reliance of a country on its comparative advantage, supported by a competitive market framework and the participation of the government as a facilitator. 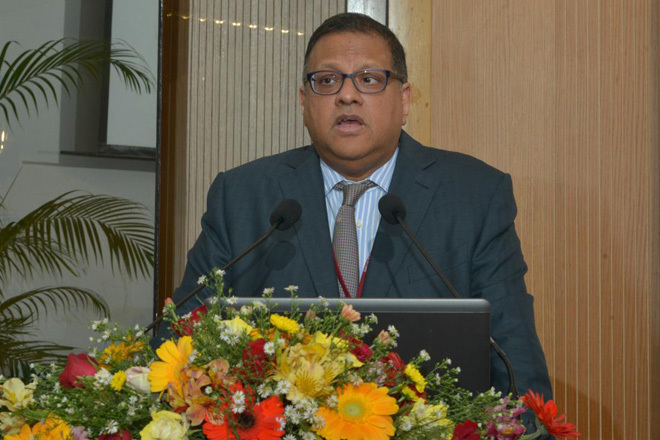 The inaugural address of the conference was delivered by Mr. Arjuna Mahendran, the Governor of the Central Bank of Sri Lanka. Discussing new elements of the global financial economic architecture in the aftermath of a global recession, the Governor highlighted the presence of significant challenges for emerging economies in the near term. The Governor emphasised that Sri Lanka has not integrated itself adequately to the international value chain and hence, the country has not fulfilled its growth potential. The Governor was of the view that the Research Conference would provide new perspectives on how structural changes in global economies impact small countries like Sri Lanka while being a guidepost in terms of how the Sri Lankan economy can further integrate into the global value chain, which is essential for ensuring the country’s future economic prosperity and stability (presentation slides of Professor Lin’s speech and the full text of the Governor’s speech are available on the website of the Central Bank of Sri Lanka. The Central Bank of Sri Lanka intends to hold its next International Research Conference in late 2016.